The Cuisinart CTF-615 is a digital programmable temperature fork. 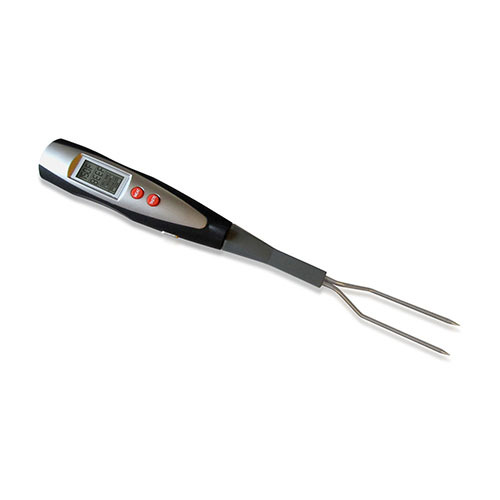 This fork helps to check whether foods like meats, poultry and seafood are never served undercooked. Set the desired temperature or cooking level and take the guesswork out of grilling. Use the 99 minute countdown timer to remind when to turn or baste food. The audible and flashing alarm alerts when food is done. When finished grilling, simply remove the fork tines for convenient dishwasher-safe cleaning and sterilizing. 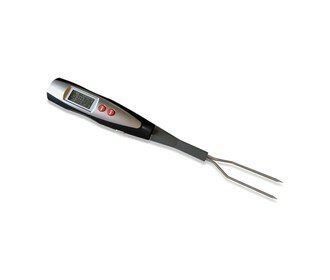 The Cuisinart Digital Temperature Fork With Light has many exciting features for users of all types. You can extend the lifetime of your Cuisinart Digital Temperature Fork With Light with the purchase of a FactoryOutletStore Factory Protection Plan. The Cuisinart Digital Temperature Fork With Light is sold as a Brand New Unopened Item.